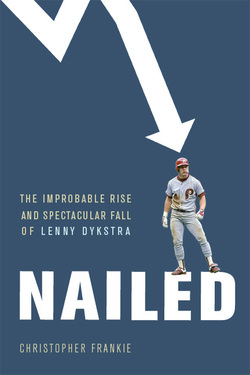 Nailed - Doug Grad Literary Agency, Inc.
Business writer and former Dykstra employee Christopher Frankie writes an inside look at former Mets and Phillies star outfielder Lenny "Nails" Dykstra and all the craziness that went on with him before he landed in the slammer in 2012 for three years. Nailed traces Dykstra from his tumultuous childhood, his major league baseball career, his improbable rise in the business world (through his car washes, then through his stock-picking newsletter and magazine for high-rolling athletes), through his fast fall from grace into bouts of paranoia, drinking, drugs, and borderline insanity. It’s an American tragedy—a rags to riches and back to rags story that is the proverbial train wreck—horrible but so compelling you just can’t look away. A fair look at a controversial character, Nailed will be a book readers won't be able to put down. Christopher Frankie worked side-by-side with Lenny Dykstra as editor of The Players Club, Dykstra’s high-end lifestyle and finance magazine, and as Dykstra’s primary confidant. Frankie has been a financial journalist for over fifteen years, and has written for Newsday, The Financial Times, and thestreet.com, among others. He lives in New York City.